પોષ મહિનો આવે ત્‍યારે મુષ્‍યોએ સ્‍નાનાદિથી પવિત્ર થઇ ઇન્‍દ્રીય સંયમ રાખીને કામ, ક્રોધ, અહંકાર, લોભ અને ચુગલી વગેરે બુરાઇઓનો ત્‍યાગ કરી દેવો જોઇએ. શ્રી હરિનું સ્‍મરણ કરીને જળથી પગ ધોઇને જમીન પર પડેલ છાણનો સંગ્રહ કરવો. એમાં તલ અને કપાસ મેળવીને એકસો આઠ છાણા બનાવ્‍યા પછી પોષ મહિનામાં જયારે આદ્રા અથવા મૂળ નક્ષત્ર આવે ત્‍યારે કૃષ્‍ણપક્ષની એકાદશીનું વ્રત કરવા માટે નિયમ લેવો. ત્‍યાર બાદ બ્રહ્મણની પૂજા કરવી. એને છત્રી પગરખા અને વસ્‍ત્રનું દાન કરો. દાન કરતી વખતે કહો કેઃ “આ દાન દ્વારા શ્રીકૃષ્‍ણ મારા પર પ્રસન્‍ન થાય !” પોતાની શકિત પ્રમાણે શ્રેષ્‍ઠ બ્રાહ્મણને કાળી ગાયનું દાન કરવું. બીજુ વિદ્વાન પુરુષે તલથી ભરેલ પાત્રનું દાન કરવું જોઇએ. એ તલ વાવવાથી એમની જેટલી શાખાઓ ઉત્‍પન્‍ન થાય છે, એટલા હજાર વર્ષો સુધી એસ્‍વર્ગલોકમાં વાસ કરે છે. તલથી સ્‍નાન હોમ કરવું. તલનું ઉબટણ કરવું.તલથી મિ‍શ્રિત જળ પીવું. તલનું દાન કરવું. અને ભોજનમાં તલનો ઉપયોગ કરવો. When the happy month comes, when the holy ones are sanctified by bathing, they should be left behind for work, wrath, ego, greed and chughli, keeping in mind spiritual saiyam. Recalling Shree Hari and washing the feet with water and collecting dung lying on the ground. After making 100 or so grams of sesame seeds and cotton, take the rule to vow for Krishna's Ekadashi when the Adra or the original Star arrives in the month of Posh. By making a proper place, worshiping the goddess Shree Lahiri by becoming pure and pure. If someone makes a mistake then criticize Lord Krishna. Night vigil and home. Worship of sandal, chakra and mudra sherri in the material from Chandan, Kapoor, Nayivedya etc. After that, remembering Lord and repeatedly chanting Shrikrishna, worshiping of the pumpkin, coconut, or bajor, by worshiping God, will be done. " Due to the absence of all other materials, donations of Pooja and Ardha can also be donated by hundred traders. This proportion of Ardha mantra Is there. "Hey Krishna! You are very kind, you become a patron for a shelterless life like us. We are submerged in the world. This is our good pleasure, and this is auspicious. Accept with my given Ardha Lakshmi. " Then worship of Brahmin. Make a donation of umbrellas and clothing. When making donations, say: "By this donation, Lord Krishna is pleased with me!" According to his strength, donate a black cow to the best Brahmin. The second scholar should donate a donkey filled character to the groom. By sowing the sesame, more branches of theirs are produced, so many years, they live in Esvaldol. Do the bath house Boil the sesame seeds. Drink water mixed with water. Donation of sesame seeds And use sesame seeds in the meal. This is the best! 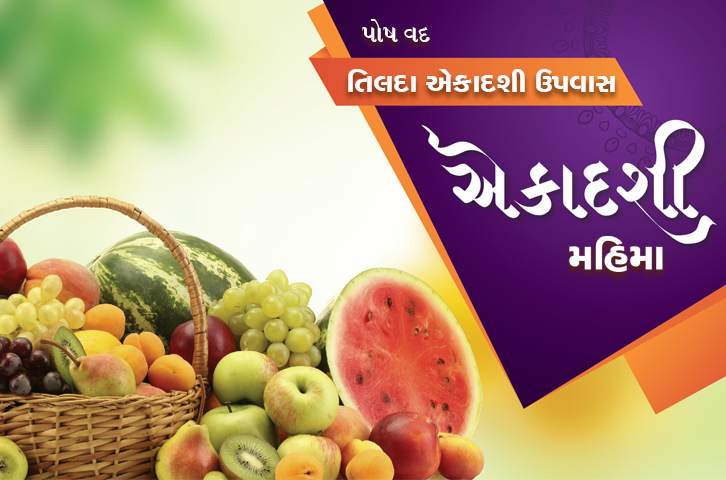 With the use of sesame in six functions, this is called Tilada Ekadashi, which will destroy all sins. "